The first time I walked into a baby store to sign up for my baby registry, I was completely overwhelmed. It is so hard to believe that something so small needs a ton of stuff, but they do! From pacifiers and bottles to blankets and cribs, having a baby means having a lot of stuff in your house. Finding ways to organize and store all of this stuff can be very challenging. Luckily Playtex understands that busy parents need storage solutions to have baby essentials ready at their fingertips. I am in love with the SmartSpace Drying Rack. 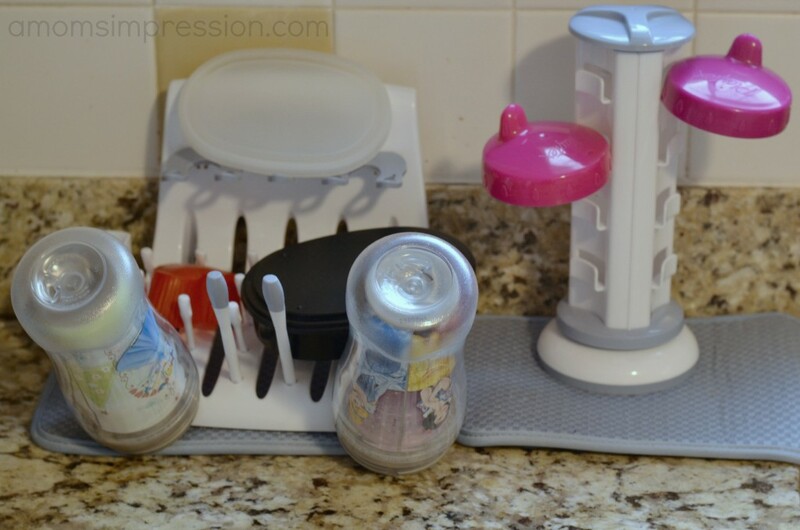 Even though Caroline has been out of bottles for about a year now, I constantly need a drying rack for all of her sippy cups and lunch items. The SmartSpace allows you to customize the drying rack to suit your needs. Since we no longer have a billion bottles to wash every day, I separated the two drying rack units so that I am saving counter space. 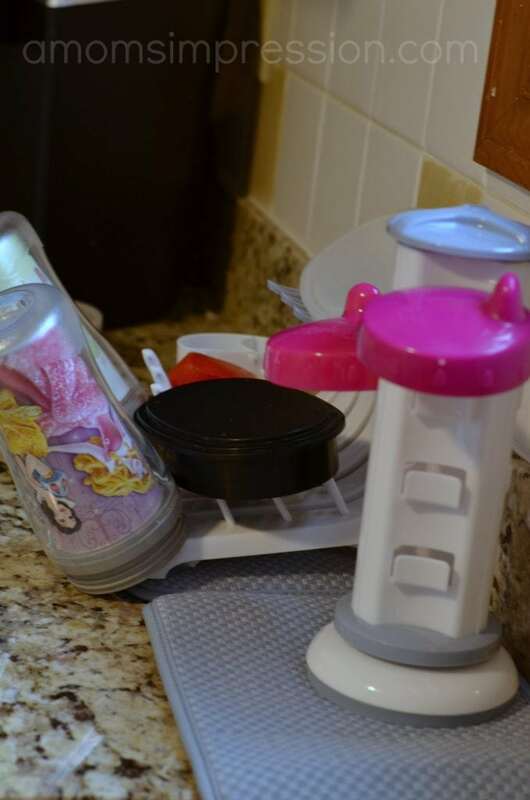 The one unit, combined with the SmartStand Lid organizer, contains more than enough space to dry Caroline’s things. Speaking of the SmartStand Lid Organizer, where has this been my entire life? I am so sad that I just got this a few weeks ago as it has completely changed how I store my cup lids. Before I would lay them flat to dry and then put them up in the cabinet next to the cups. It was a huge mess. Now, each lid has a space to hang out next to the drying rack on my counter. 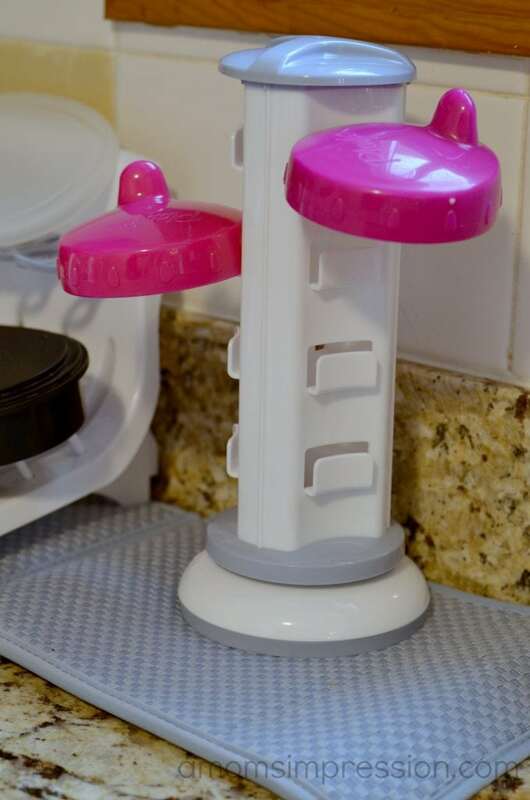 This handy lid organizer can also fit in my cabinet as an out of sight organizer getting all of those lids off of the bottom of the cabinet and at my fingertips when I need them. It swivels making it easy to reach all of my lids. Having these items organized and at my fingertips has made my lunch and snack times a lot less stressful. There is nothing like trying to find a specific cup and lid while your child is screaming for milk! Life with a baby can be challenging. Let Playtex help by keeping your feeding essentials organized and at your fingertips. You can purchase the SmartSpace Drying Rack and SmartStand Universal Lid Organizer at retailers everywhere. Or, you can win one right here! 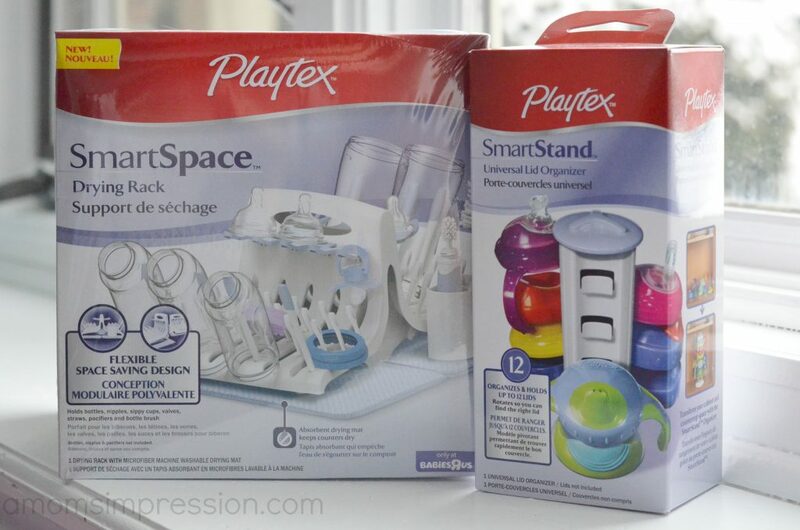 10 lucky winners will received both a SmartSpace Drying Rack and SmartStand Universal Lid Organizer courtesy of Playtex! I have several bins that I’m currently trying to use to stay organized. since my 1st grand isnt due til this summer… & SOOOO much has ‘changed’… I’m still working on organization ideas! This really looks like a great help! That’s the problem… I am NOT organized! This product looks like a great solution! I just keep mine in different plastic bins in the kitchen! We don’t really do “organized” around here. Stuff just ends up where it ends up so we try to have a few of everything that way your bound to find at least one. To stay organized, we try to stick to the basics! I keep bins and baskets of different things. I don’t! I sure could need one of these, because I am getting annoyed with all of the bottles and sippy cups on my counter. its a constant struggle to stay organized with 7 children. I keep rethinking my organization methods too. Organized? I have four children, organization is beyond me 🙂 I try to keep all the kids tableware in the same cupboard. As for other items I use totes and drawers.